Henry Humming takes you on a heartwarming journey filled with suspense, adventure, and comedic situations. It’s a story about hope, love, and true friendship. SKU: VR26503. Categories: Childrens, Juvenile Fiction. Tags: children, courage, family, friendship, humming bird, kids, story time. A hummingbird, a blue jay, and a house finch go on an unexpected journey filled with many obstacles to find a cure for the hummingbirds dying sister. Henry Humming is a determined ruby-throated hummingbird that will do anything for his sick sister, Hanna, even if that means risking his own life. Henry takes on the role of being the caretaker for Hanna. Hanna encourages Henry to travel and gives him a list of ingredients that could provide a cure for her. Henry is skeptical about a natural cure and doesn’t want to take the chance of leaving and not returning in time or returning without the cure. But Henry has little choice when he and his two friends, Jay-Jay and Stella, are whisked away by a tornado. Henry has to re-evaluate his new situation. He could fly home immediately, only stopping for directions, food and little rest OR he could take this opportunity to find the items for the cure. Will Henry be able to find the items for the cure? Will he confide in his two friends who have no idea his sister is dying? What enemies will try to stop them? Irene W. Starlone is the author of Henry Humming, the first book an adventure series. She was born in South Carolina but was brought up most of her life in Louisiana. She currently lives with her husband and their two daughters. She is an avid reader and writer and has been fascinated by hummingbirds her whole life. Those three passions came together in Henry Humming. 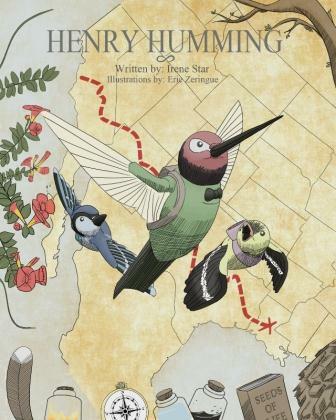 From Big Bend National Park, to the Texas State Fair, to the Dallas Farmers Market, to the Alamo, this fun book takes readers on an adventure around The Lone Star State, accompanied by a friendly mockingbird (Texas state bird), who gives cool facts on every spread!